Do Americans Want To Live In Hillary Clinton’s Village? Twenty years after ‘It Takes a Village,’ we finally have our chance to start constructing Hillaryville by electing Hillary Clinton as president. No one really wants that. I don’t know about you, but I’m pretty excited about this glorious new adventure in American history, as marked by Hillary Clinton’s new presidential campaign. I mean, just think. Seven years ago, America elected its first African-American president, thus initiating a glorious new era of racial harmony such as we had scarcely imagined was possible in this benighted country. Now here we stand, poised to heal gender relations for the foreseeable future by electing the charming and winsome former First Lady to the nation’s highest office. Who could resist the allure of writing such a nationally beloved figure into the history books? Her grace and integrity will stand forever as a shining model of American womanhood. All right, back to reality. Who is Hillary Clinton, anyway? We’ve lived with her for decades, but I’m still confused on this point. She’s like an onion, except her depths are not of personality but of lies, corruption, and artifice. Is there an actual human underneath the hundred masks? If she visited the Oracle of Delphi, would she spontaneously combust? Instead of raising our children to be lean, mean, and streetwise, Clinton wants us to turn the entire United States of America into one, big, nurturing village. 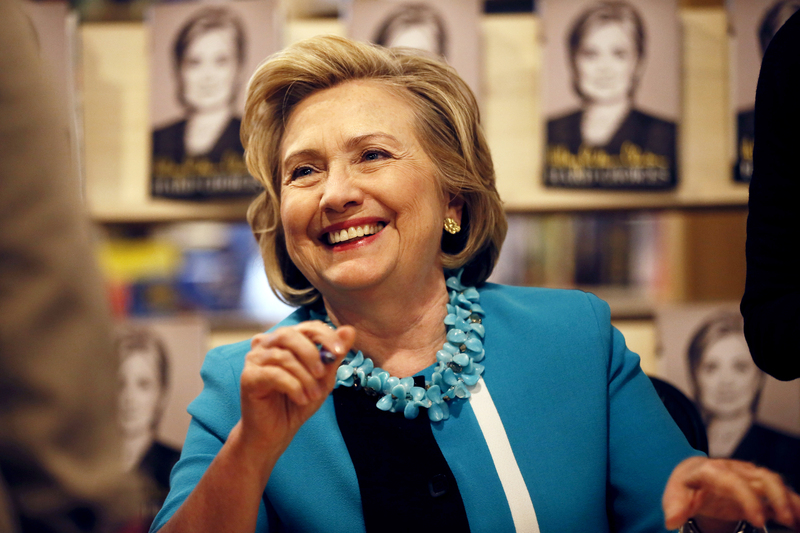 In her 1996 book, Hillary Clinton presents herself as a champion of children’s rights. Now, this is curious, because I was under the impression that (as her new website briefly announced) Clinton has “fought children and families all her career.” But it turns out that statement was just a typo. She actually does claim to be a champion of families, and as her model of how to help children thrive, she presents to us “the village.” Instead of raising our children to be lean, mean, and streetwise, Clinton wants us to turn the entire United States of America into one, big, nurturing village. It sounds… well, I don’t know. What will Hillary’s village look like? Twenty years later, we may finally have our chance to realize it. But do we want to be her village people? I’ve seen lot of villages around the world. They run the gamut. There are quaint, charming villages with fantastic scenery and adorable window boxes. The people come together to celebrate festivals and to support each other. Children run wild, but are exceptionally safe because everyone looks out for them. In short, the ideal village is a functional and tight-knit community in which people enjoy warm and lasting human relationships. I’m guessing this is the sort of village on which Hillary Clinton would like to stamp her name. Not all villages are like this, however. There are villages where kids grow up thinking, “Someday I’m going to escape.” Overbearing elders and gossipy old women control everyone’s lives. People stand around on corners discussing their neighbors’ marital disputes, and neighbors bicker over whose child vandalized the street signs. The thing about a village is, it doesn’t tend to offer a lot of opportunities or life choices. When people feel unfree and hemmed in by social expectations, they can consume themselves in pettiness and envy. Finally, there are villages that lead a visitor to ask, “Why is this place still inhabited?” Utilities are spotty and businesses are decaying or non-existent. Men stand idly on corners in the middle of the day because there are no jobs. Women are constantly sweeping the steps, yet everything still seems to be perpetually covered in dust, as though in a movie being shot through a yellow filter. It’s a ghost town that just happens to be inhabited. I visited many dysfunctional villages as a Peace Corps volunteer in Uzbekistan. After a time, I began to understand why many Uzbeks didn’t share my American-city-slicker vision of the village as a quaint and charming nest of functional community. In Uzbek, the term for villager (“kishloche”) is usually slung as an insult. Think “simpleton” or “redneck.” That’s what Uzbeks think of their villagers. To many, the village stands as an exemplar of everything that is backwards and broken in society. To many, the village stands as an exemplar of everything that is backwards and broken in society. Truthfully, the “pros” and “cons” of village life tend to go together. In small communities, people get to know one another and build close, tight human bonds of a sort that city dwellers often fail to develop. They take care of each other and, yes, they look after each other’s kids. But those bonds can also become oppressive to people who (for whatever reason) don’t quite fit the community ethos. Small communities also tend to be outside the path of technological and cultural progress, which might make them jewels of traditional wisdom, but could also leave their inhabitants provincial and small-minded. It’s hard to get lost in small communities (literally or figuratively), but, on the downside, there may not be many opportunities for personal (or familial) improvement. Don’t worry, though. Hillary Clinton’s “village classic” reminds us that it’s possible to have the worst of both worlds. Hillary Clinton is no villager. She’s fantastically rich, and probably the best-connected woman on earth. That’s all right, though, because she doesn’t plan to inhabit the village. She wants to rule it. And under her benevolent rule, she fully intends to organize the rest of us into a charming village (of sorts). Get to work on those adorable window boxes. Clinton’s village ideal comes back again and again to one theme: parents aren’t enough. Clinton’s village ideal comes back again and again to one theme: parents aren’t enough. We need all of society to be oriented towards the thriving of kids. A whole chapter explains that “No Family Is an Island” (we need institutions!) and another reminds us that “Kids Don’t Come with Instructions” (so we’d better let bureaucrats teach people how to parent). Again and again, she urges us to pull together and do it for the children. What exactly should we do for them? That’s actually somewhat interesting. In lamenting the ills of contemporary (or, well, 1990s) society, she sometimes hits notes that sound almost socially conservative. For example, she bemoans a divorce-happy culture that denies kids a needed sense of security, and even goes so far as to mention that no-fault divorce bears some of the blame. She hints that rising rates of illegitimacy are a source of concern. The mid-90s Mrs. Clinton had noticed that social breakdown was a problem in America, and she didn’t like it. So how do we fix it? Support more local autonomy so people can rebuild their communities? Peel back the welfare state to minimize perverse anti-marriage incentives? De-regulate to encourage more economic growth, so working-class men can be better providers? Or how about we start with the most basic pro-child measure imaginable: stop killing the unborn? Don’t make the mistake of thinking that Clinton’s recommended ‘village life’ has anything to do with empowering people. No, of course we should do none of those things. Don’t make the mistake of thinking that Clinton’s recommended “village life” has anything to do with empowering people, or building self-sufficient communities where we take care of one another. If readers are inclined to get nostalgic about an earlier America (when human bonds were thicker and people more self-sufficient), Clinton scolds them and reminds them that America was racist and sexist. In our glorious new village, we won’t have to depend on natural, organic relationships. That might become disturbingly politically incorrect, and anyway people have a tendency to mess stuff up if you let them. We’re all going to put in our oar for children, but Hillary has obligingly offered to be our coxswain. Forget about local autonomy or community cohesion. It’s not that kind of village. So we don’t enjoy the satisfaction of self-sufficiency, or the tight-knit bonds that tend to develop when humans rely on other humans they know. No worries, though! We can still have some elements of village life: the oppressive, inflexible patriarchs and the gossipy old women. Hillary Clinton’s state is replete with nosy interventionists who will happily interfere in our personal lives. With luck, we’ll get a stagnating economy to boot. Hillary Clinton’s state is replete with nosy interventionists who will happily interfere in our personal lives. Hillary is an established nanny-statist, and her book is not the exception. She spearheaded the first great failed initiative for national health care. She rhapsodizes about sparkling, government-planned preschools where children can begin as early as age three to be “civilized.” She loves public schools, public daycares, public facilities, public everything. “Public” is magical to Hillary Clinton, because it means she can plan and arrange things and make them all better. If we elect her, she may well be the first woman in history to take “just let me do it” to a truly national scale. Of course, there are also rules. Clinton likes banning things: guns, drugs, possibly-dangerous toys. She’s rarely met a regulation she doesn’t like, whether for business or trade or carbon emissions. Why should we put up with this? For the children, of course. There actually is a certain logic to this. Clinton, like all good liberal progressives, takes the breakdown of America’s social fabric as a given, not a problem that can be solved. She certainly doesn’t want to broach the question of whether the abortion regime, the welfare state, and (more recently) the mad dash towards “marriage equality” may have destabilized family structures in a way that’s harmful to children. She does lament the decline of the stable, two-parent family, but her solution is not to rebuild it. Instead, she simply places the state in loco parentis and carries on. It’s interesting that, even in her efforts to make her “village ideal” relatable through childhood reminiscences, Clinton waxes sentimental about institutions more than people. She tells us that she had great parents, but also “caring neighbors, attentive doctors, challenging public schools, safe streets, an economy that supported my father’s job.” Even the job is somehow presented as though it’s a benevolent gift of a well-planned society. Be grateful, kishloche, for what Uncle Sam hath given. In many ways, the issue of children’s rights may exactly the right one for clarifying the choice presented to voters. Clinton likes to present this as a choice between a cold, uncaring, dog-eat-dog world, and one engineered by enlightened people like herself who only want bless the beasts and the children. She tells us in the first sentence of her book that children “aren’t born as rugged individualists.” That’s perfectly true. But it’s important that conservatives explain that this is not the real contrast. Clinton likes to present this as a choice between a cold, uncaring, dog-eat-dog world, and one engineered by enlightened people like herself who only want bless the beasts and the children. As a mother of four, I of course want to live in a “pro-family” America. But we still need to ask: what kind of “village” do we want our children to inhabit? One in which children are legally protected even before they are born, and are seen first and foremost as members of families and natal communities? One where men and women are expected to be responsible grown-ups who make decisions (maybe even—gasp!—including their own professional and relationship choices) for the welfare of their own kids? One where neighborhoods and communities are given room to decide what kinds of schools and organizations they want to support? Or would we rather let Progressive planners turn our whole nation into one enormous “village,” effectively instituting a statist nursery school from sea to shining sea? Would we prefer to hand our wages to bureaucrats so they can decide what kind of experiences and institutions our kids really need? Shall we just decide right now that the only adults who can be trusted to make good decisions are elected officials and their appointed cohorts? Twenty years after “It Takes a Village,” we finally have our chance to start construction on Hillaryville. Let’s not.